"The Hunter Gets Captured By The Game" / "Everybody's Been Burned"
Pre-season reviews of Aquarius have offered a mixed bag so far. Many reviewers, like our own Noel Murray, have noted that it tries to offer too many options at once: a hard-boiled detective show, a case-of-the-week, and a depiction of the pre-Helter Skelter days of the Manson Family. Aquarius succeeds at some of these efforts (the former) more than others (the latter), but is mostly well-done enough to keep us hooked from week to week. 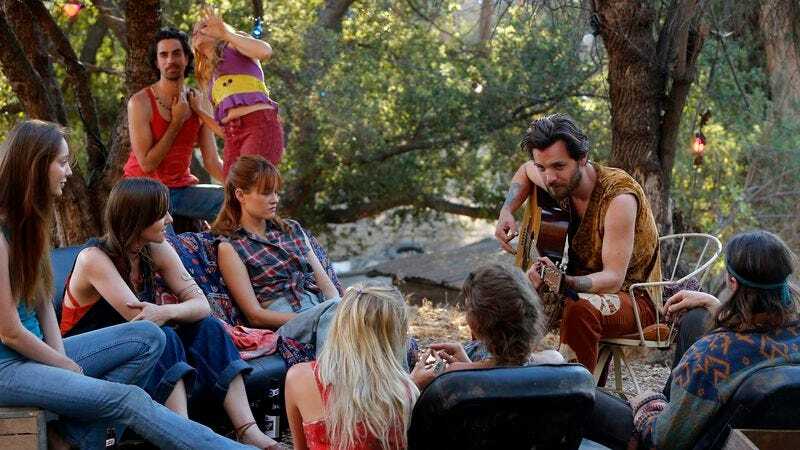 The first episode succeeds more than its second, as a young couple attends a happening party to the tune of ominous hippie music and is quickly drawn into a dangerous world. Young Emma (Bunheads’ Emma Dumont) decides to stick around, so we get to see how an outsider would view their induction into Manson’s universe. Even down to the most basic levels, like how people with no means of support would get clothing (shoplifting) or food (dumpster diving). Game Of Thrones’ Gethin Anthony portrays the cult leader as more of a heartbreaker than the sociopath we’ve seen recently (in Jeremy Davies’ TV-movie version, for example), and the script uses examples from Manson’s own life, like the time his mother sold him to a waitress in a bar. It’s hard to believe that this character was so charismatic to have almost-perfect strangers completely bend to his will, but that’s why hoards of people follow some people around, I guess. I had to guffaw at episode two’s final twist, though, that even Emma’s square politician dad is into Manson. Did not see that one coming. One one hand, it explains why her father would keep quiet in 1967 about the maniac his teenage daughter is shacked up with; on the other, dude, the guy cut your neck with a razor. What’s romantic about that? Manson (along with post-Summer-Of-Love events like Altamont) has come to represent the dark side of the hippie movement, creating a mystery as to how a group of people who preached so much peace and love could be led around by someone so delusional and homicidal. Aquarius’ time on the Manson ranch may veer into a sociopathic soap, but it also points out what made Manson so appealing for runaways like Emma. It was a disturbing time. Although flappers rebelled in the 1920s and rock’n’roll inspired a youth movement in the ’50s, none of these came close to rejecting society outright like the hippies of the late ’60s, a group who had lost faith in the things they were supposed to believe in, like their parents, or God, or the government, or their country that was drafting its young men into what was considered an unjust war. These anchorless youth needed something to hold on, which is what drew them to false leaders like Manson, and, a little later, Sun Myung Moon, and David Koresh, who broke everything down for them into the simplest terms. Members of these group no longer had to think anymore in a confusing time, just follow. Someone like Detective Hodiak, commandingly played by David Duchovny, wouldn’t understand the appeal of any of this. A straight-laced, hard-hitting detective, much more Scully than Mulder, he’s so out of touch he has to corral a hippie whisperer (Grey Damon as Brian Shafe) to be the bridge in his own personal generation gap. Duchovny is surprisingly effective as a hard-boiled gumshoe, the type that sticks out at a hippie party like a sore thumb and would rather knee a suspect in the groin than read him those pesky new Miranda rights. Hodiak’s softer side is spotted as he tries to track down an old flame’s daughter (speculating that these two hook up in three, two…) and grapples with his alcoholic almost ex-wife and AWOL son. If Emma is there to explain the Manson appeal to us, Shafe is there to express outrage at these changing times. Protesting police brutality, he gets hauled off in the paddy wagon even though he’s a cop. He seemlessly fits in at California hippie parties, and looks relatable enough to draw some information out of a witnesses without using his knees at all. He’s also there to point out how hopelessly out of touch Hodiak is, pondering if they’ll even be able to work together. A mismatched police duo? A good cop and a bad cop? Who has ever heard of such a thing? And herein lies one of Aquarius’ main pitfalls: everyone, unfortunately. By episode two, the show throws in a case of the week, perhaps to give us a needed Manson break, perhaps to seize this opportunity to tackle another vital 1960s subject. This time, it’s race relations, as a man tries to peg his wife’s murder on the blacks he says have taken over his neighborhood (in some very disturbing language), but Hodiak wasn’t born yesterday. Far from it. But these police-procedural parts seem awfully familiar, no matter what era. Although it’s fun to see Hodiak and Shafe doing cop stuff like hunting down snitches, these efforts clutter up what already had a lot of clutter in the first place. In the crowded field of Aquarius, the search for Emma is the most compelling part of the narrative, but we know she won’t get found for awhile, because then what? As it struggles to gel these different plots together, Aquarius offers details and dialogue that are at once to the point and over the top. As Noel mentioned, the Alice In Wonderland imagery in Jefferson Airplane’s “White Rabbit” as Emma and her boyfriend hit the happening party is a page right out of the hippie playbook, but other songs of the era, like The Who’s “I Can See For Miles,” more effectively paint the audio picture without being too obvious. And there are often intriguing juxtapositions to be had, like a shop clerk losing his life to The Monkees’ “Daydream Believer” (with a closeup of Emma right on the “homecoming queen” line) and “Danke Schoen” soundtracking the Manson and Rank parking-lot meeting (still not sure what that was supposed to signify). The same can not be said of some clunky dialogue, as some of Manson’s rants veer off into the humorous: A secretary offers to take a message for him and he seethes, “You take and you take and you take!” Or when Hodiak reveals to Shafe that he also may have smoked the marijuana (“You kids, you think you invented everything”) or Hodiak’s son telling him that times have changed. Even though Duchovny still doesn’t look that far removed from Twin Peaks, he’s entering a whole new era. He’s the only actor of name on Aquarius, but his gritty lost-in-the-time-period Hodiak may have enough appeal to pull the whole series off. Just Hodiak taking his sunglasses off is enough to make a snitch squeal. A beef: Michaela McManus who plays Grace is 23 years younger than Duchovny, her supposed old flame. Maybe she’s supposed to be playing older, but IRL if these two were together before Emma was born, that would make Grace a teenager herself at the time and… ugh, math. Although NBC is offering all Aquarius episodes on demand after tonight, I will be remaining unspoiled as I write these reviews over the next 11 weeks. As will many readers here, so please keep spoilers out of the comments. Although it’s not like we don’t know what Manson’s going for in the end.